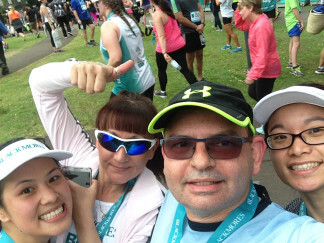 The run raised over $5,000 for Miroma (branch of Inala). This is a day-time provider for James, my son, who is now 19 years old and has completed school. He has hardly any speech. Miroma has been fantastic as they are working with us through this dramatic change in James’ life. I think it’s tough being an adult with a disability; they are almost forgotten. We worry about how he will be we are no longer here. The people who make up these organisation work under difficult conditions but they are dedicated, kind and they listen. We are very fortunate! I would like to thank all the donors for such a fantastic effort that will change the lives of so many people. The money raised will be used towards developing virtual music programs. This will allow Miroma to purchase virtual instruments that allow people with all abilities to get involved. This includes an instrument that can turn any object into percussion or an instrument. For example a banana can turn into a drum. There are other instruments that use body movement to make sound. Music is so therapeutic for people with disabilities and being able to use innovative and virtual music will expand the experiences of people attending Miroma. 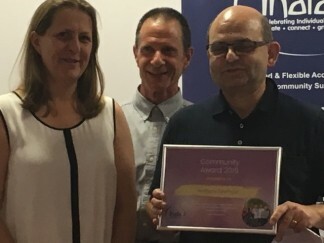 Inala were kind enough to present a community service award for the run. We hope it has raised awareness for young adults with disabilities. I only pounded the pavement thanks to the help of three ladies: Roni, Kim, and Joy, but the person who deserves all the recognition is Eva, my wife, who has had to deal with James 24/7. James can be very tiring as he needs your constant attention. Then, there is all the paperwork and dealing various organisation and Centrelink to obtain services, and to sort out all his medication and dietary needs. I get to go to work. Community Service Award from Inala with the executive officers Team Miroma 'we did it' selfie - yeah baby!